I often think there's a hardware solution, but then you realise that adding even one dipswitch would up the cost massively! Perhaps a plugboard would give a decent solution. But since an attacker can likely try a thousand plus passwords a second for years without detection, would even that work? The developers are the cheapest nephew scripter the subcontractor could find. Or perhaps that guy in the dinner across the street who has an I <3 Emacs sticker. Is well known that security doesn't sell to 99% of the market. All the big breaches have negligible impact to corporate earnings for giants -- how could Chinese cut rate manufacturers do better? Anyway, get the raspberry pi camera rather than USB; the control and performance through the camera/GPU interface is well worth it! Actually, it doesn't need to be as easy as pulling the password out of flash. If they would have used a strong password AND stored it as a secure hash with a actual random salt, then there would at least be a huge barrier to cracking the password. Cool, I think I've hacked one of these before. If it's the same thing I saw, there was a command injection in del_file.cgi. Looks like an EM6220. Which other brands and types might contain the same vuln, interesting... don't think this vendor has developed everything in-house. I can neither confirm nor deny this is an EM6220. 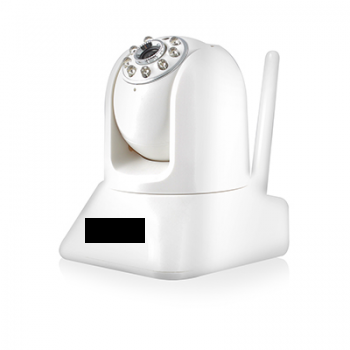 But if you google the hash of the password along with IP camera, you can find quite a lot of other vendors are affected. The picture posted is of an Eminent EM6220: http://www.mobile-harddisk.nl/product/4666/eminent-em6220-ecamview-pantilt-ip-camera.html?language=en. While one would simply assume the author used a random photo to showcase a sample IP camera, since the author blurred out the name on the camera that would show that it's the photo of the actual camera. But while this article is on the EM6220 the author also notes it affects other cameras. Nice shell injection work. I guess people shouldn't really use shell. Nice find on the command injection though, I didn't even think of trying that! I need to dig the Aldi camera out of my box of IoT crap and check whether it's also vulnerable! And yes, you can cross compile nmap and netcat for it - though you don't have much storage space! I brute-forced the telnet a while ago hoping to dig out the decoder_control.cgi and camera_control.cgi but I cannot find them anywhere. I tried to mount the additional mtdblock devices to see if they are in a read only boot rom but they won' load. Can i use this camera video for Zoneminder ? Yep. Found all the passwords from the camera via telnet. I have a "hosafe" nvr and i like root password. Did anybody analyze the UDP cloud protocol? To get my p2p cam (doorbell) working as i want, i need to decrypt the protocol and build my own "server". Is it possible to block the cloud services from ROUTER? I don;t like the idea that anyone can have have access to my camera, I prefer to use my camera local or via VPN tunnel. I'm with "Marie's erster Blog". I'd like to setup my own server for this. 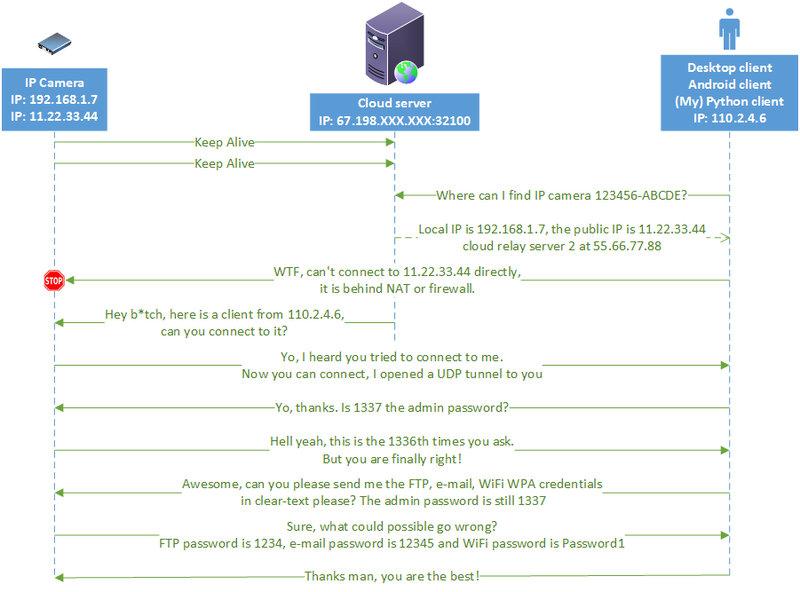 I am able to intercept the keep-alives, but need to know the payload to trigger the UDP tunnel. The cloud server that my ip camera came preconfigured with is unreachable, so I can't even do a trial run to see what they are sending back. I still have the camera (not connected to my local network) and recently I wondering to make use of it somehow. 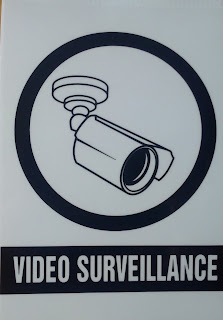 So it'd be nice to - after revealing the facts how bad are these little cameras - looking for a kind of a solution. Ordinary people think totally insecure like "hey, this food is toxic but it's soooo cheap" :-) If we can't change their mindset then let's propose a proper secure solution for the problem that someone want to see the home garden from an Android phone - just because it's a justifiable demand nowadays. In other words, you showed that using a cheap Chinese cam out of the box is a bad idea, so what's next? Thanks. Hi. May i know if you are able to hack my IP camera to retrieve backdated footage? I believe some of the footage was recorded but i cant retrieve it because it has seemingly been 'deleted'. Do PM me for more details. I am keen to compensate as there are some evidence on this footage which we are very keen on retrieving! It was just after midnight 17th Sept 17 and I was woken by the sound of the camera panning. I logged on to the Yoosee App on my mobile phone device to see it panning around left right ect. I then panned the camera in the opposing direction and it panned back. I then noted it said 2 audiences. I then panned the camera to the ceiling and it was then the audience went to 1. I immediately went to the camera and disconnected the power supply. Don't know if there is still code injection possibility through one off the .cgi scripts? Anonymous chinese IP Cam, ESCAM like. Found telnet on TCP port 8357. No one of the known password found googling around worked. I was able to collect /etc/passwd using cgi injection and to feed john-the-ripper. Not sure after this sentence - if I am dropping any communication from camera (identified by MAC address) to the Internet, I AM safe, am I not?